The fun part, though, is that Pérez steps past conformity with the conventional English/Spanish translation trajectories. He throws borders into question, and his incursions across languages take various forms, which have in turn forced me to cross and blur lines. In addition to the books he composed in Spanish, such as Algo de lo sagrado and ¿Oíste hablar del gato de pelea?, Pérez has experimented with bilingual and multilingual writing in the past decade-plus. Sometimes he has also taken the next step: composing and presenting original poems in English, blending his established precision in Spanish-language poetry into a deliberate embrace of amateurism. Amateurism, for Pérez, is a position indicating his willingness to take the risk of doing new and different things with his writing, in this case with English and other languages. He adopts that same, internally opposed combination of expertise with amateurism in order to frame his experiments dipping into other areas of the arts. Pérez has taken up drawing, collage, sculpture, drumming and other practices in tandem with his writing, saying that he's more interested in situating poetry in relation to other art forms than with certain intellectual dialogues. To clarify (since his poetry is sometimes complex, dense, challenging to the intellect), he remarks that the position of poet-as-intellectual has prevailed in recent decades on the island, and it's time to work on other modes instead. In 2010 I went to a recording studio in Havana with Pérez. He recorded many of his poems in the original Spanish, plus a few in my English translations, read alternately by him and by me. I also asked him to read the following four poems that he had composed in English and published in Jacket 38, where you can see the texts. 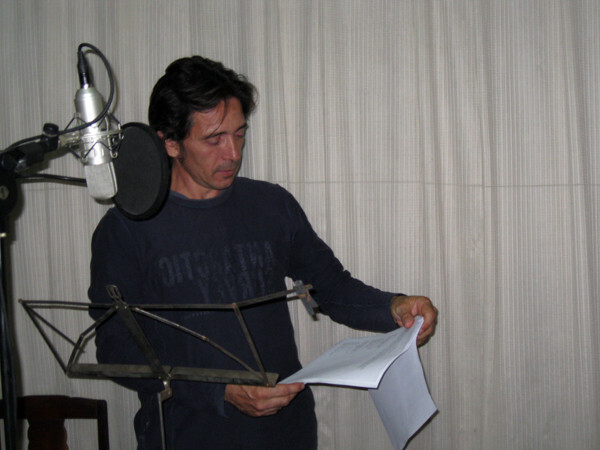 These audio recordings were made at the studio of Dennis Casteleiro, on June 1, 2010, the setting for the photograph above. The photo below shows a page from one of his "coffee-table" collage books, which I photographed in Playa, Cuba, in the same month. 1. Let's refuse to spend time on that one here & just recommend a starting point like Peter Cole's "Making Sense in Translation: Towards an Ethics of the Art," from In Translation: Translators on Their Work and What It Means, which was published by Columbia University Press in 2013.